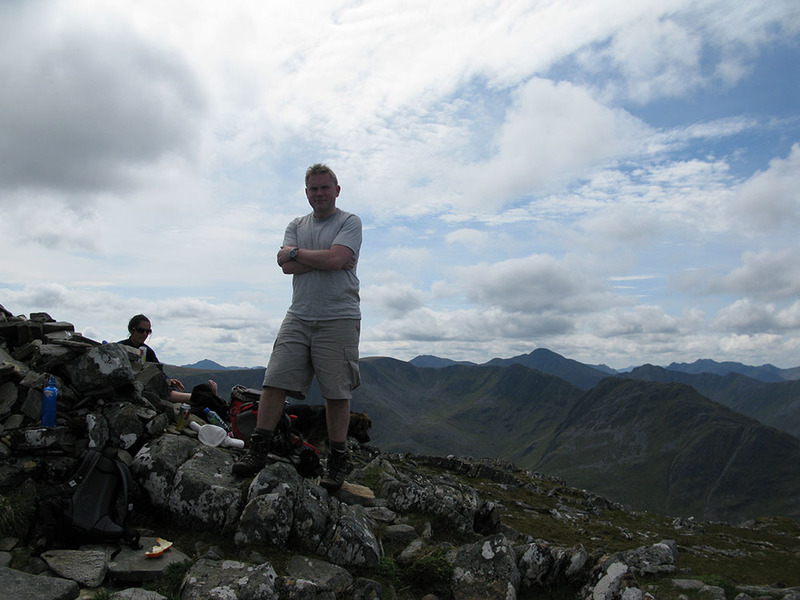 Last weekend I travelled to Kintail to climb a’Ghlas Bheinn. I knew this would be my 200th Munro, and I invited my friends Ian and Katy to join me for this landmark event, and Bella the dog also came with us. The weather was excellent for the walk, with perhaps too much heat. Our route took us up the west ridge of the mountain which was a bit of a boring trudge through boggy ground and steep grassy slopes, but I later discovered there is a better path to the south of the summit that we probably should have taken for a better experience. We celebrated with a couple of cans of Tennent’s lager on the summit and enjoyed the excellent views to Beinn Fhada, Torridon, Applecross, the Cuillins on Skye and Rum. It’s taken me 18 years of hillwalking to reach this landmark, and there’s still another 83 to climb before I can say I’ve done them all. I’m not in any hurry to do this though, and I think I’ll be taking a break for a while from bagging Munro summits.